The moment the temperature outside starts reaching 90º is the same moment I start reaching for my scissors. Not a summer has passed where I haven't cut the sleeves off a tee or turned jeans into jorts (isn't that the best word ever?). With some scissors and a bit of thread, you can turn a boring tee that you may have otherwise thrown out into your new favorite top. There are a million ways to cut up and refashion a t-shirt - here are three of my favorite t-shirt DIY ideas. If you're like me, you probably have a craft closet full of leftover supplies from past projects... yarn scraps, small pieces of fabric and lots of random bits of paper. So today we're going to share ten genius projects that will help you use up those scraps - which will also help you get your space organized! Read on to check them out. There's nothing like an iconic mid-century classic to set your home apart. Your home can be as contemporary as can be, but add even one Saarinen or Eames piece to your space, and you've connected with a movement. You've invested in a piece that, fifty or sixty years later, looks as elegant, playful, and amazing as it did when it was first unveiled. 'Cept, here's the deal: these guys can be expensive. While you're paying for comfort and style, you're also paying for the time of some of the most talented artists of the 20th century, quality materials, and, true, some copyright. So, get creative, and make your own mid-century classic! See this gift? See how it's all pretty and shiny? Would you believe me if I told you it was made from... trash?! That's right! You won't believe what this package is wrapped in! Make It: DIY Chevron-Patterned Reclaimed Wood Planter Box! I spotted this a w e s o m e reclaimed wood planter box idea on Pinterest today (Are you following us? We're pinning like mad!) and I couldn't wait another second to share it! I've got a joke for ya. When is a door not a door? When it's ajar! Also? When it's an awesome DIY coffee table! 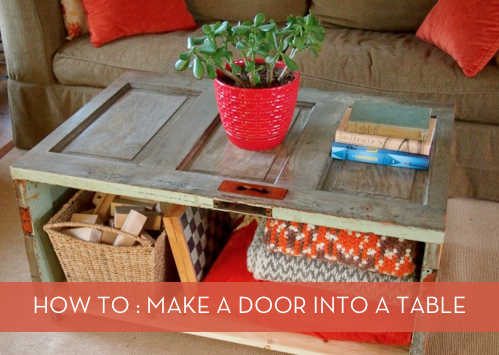 Read on to see how a $10 door became this fantastically upcycled piece of furniture. Can you guess what the maker used to create these art pieces? Here's a hint: not paint chips. These old pieces of furniture were disassembled and then re-assembled into a new piece of furniture with an entirely new purpose. Note the various hooks, all of which were parts of the chair. Dr. Frankenstein would be so proud. This, my friends, is one of the craziest/coolest things I've seen in a very long time. The delicate rose pictured above looks like it's made of porcelain, right? Of course it's NOT porcelain. Can you guess what it IS made of?